The Sencore LC102 AUTO-Z Capacitor-Inductor Analyzer takes the guesswork out of capacitor and inductor testing. It provides automatic tests of capacitor value, leakage, ESR, and a patented dielectric absorption test. Inductors are automatically analyzed for value and quality with patented tests. 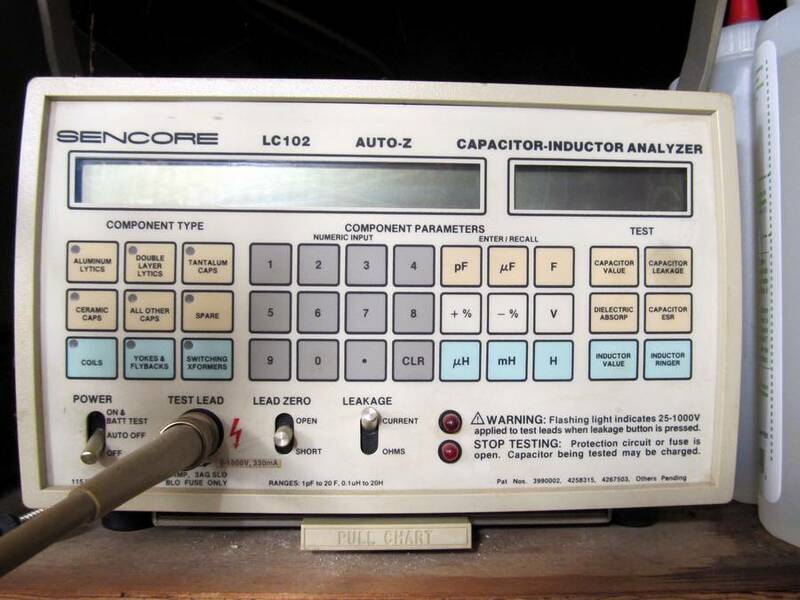 The LC102 is a complete, automatic, microprocessor-controlled capacitor and inductor analyzer. Its features make it ideally suited for both single, component analyzing in service or maintenance work or for large volume, batch testing in a lab or incoming inspection. This unit tests Capacitors at Actual Working Voltages, Up to 1000 VDC. It is Also Fully Portable, with an optional 12 Volt Gell Cell, Not Included. It includes the Operation Manual. I asking $800.00 for it, or Best Offer, plus Shipping cost. Shipping Cost will depend on Total Weight and your Destination. Go Back To "HOME PAGE"